Parkinson's disease (PD) is a neurodegenerative disorder with motor symptoms caused by the death of dopaminergic (DA) neurons in the striatum. As of yet, there is no medication to cure or halt this disease. Elevation in the amount of 6-hydroxydopamine (6-OHDA) has been reported in the urine of L-DOPA - treated Parkinson’s disease patients. 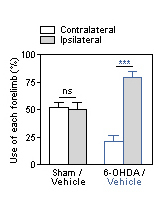 Unilateral injection of 6-OHDA in the rat brain produces lesion and depletion of striatal dopamine along with significant gait disturbance similar to those of PD patients. 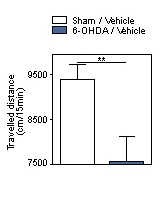 This model is commonly used to the neuroprotective potential of new test compounds. Neuroprotective compounds are usually tested in this model but other treatments could also be considered. Please feel free to contact us to discuss the feasibility of your study. 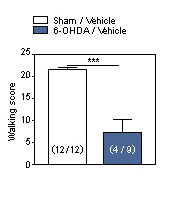 Parkinson’s disease is a neurodegenerative disease : ability of test compounds to inhibit MPP+ or 6-OHDA - induced cell damage in mesencephalic neuron cultures. Catalepsy is a well-known symptom of Parkinson's disease.